Join in the fun. Come out and meet members of our society at any of the following events. Members, if you would like to get involved in any of the activities listed below, just click on the "Send Email" link on the left side of this page. Most of the event titles listed below, are links that provide access to additional information about the event...so "click away!" have you check out our "wee" group. Who knows ... you even might decide to join us. Larry "Max" Maxwell, Marissa McCartney, David Rave and Sharon Wolf. 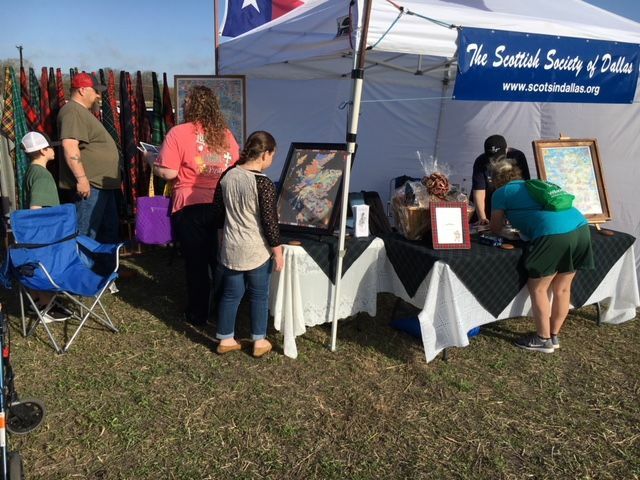 & Highland Games at their new location: the Wise County Fairgrounds, in Decatur. 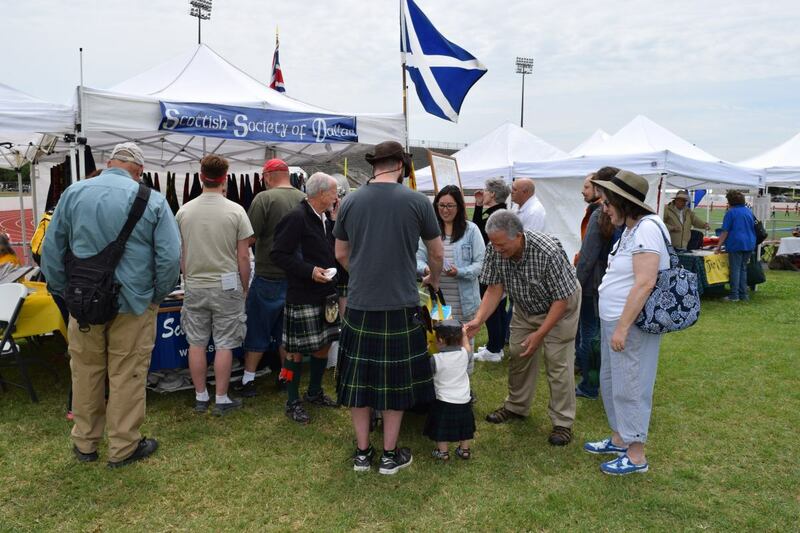 Saturday, May 14, 2016, at the Texas Scottish Festival. 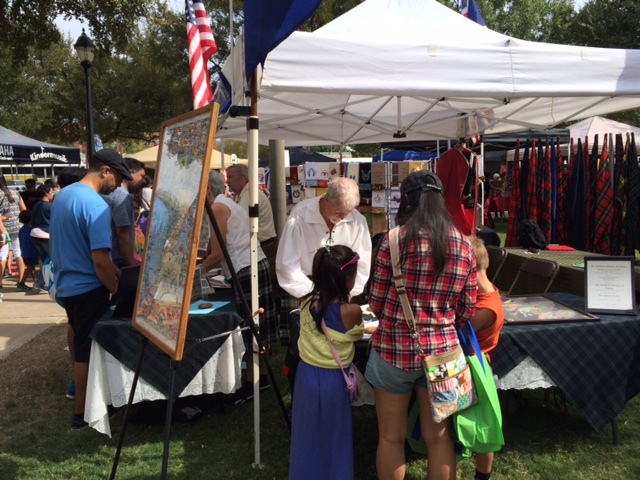 Plano International Fest, on Saturday, October 18.
our booth, talks to guests at the 2015, Plano Fest. 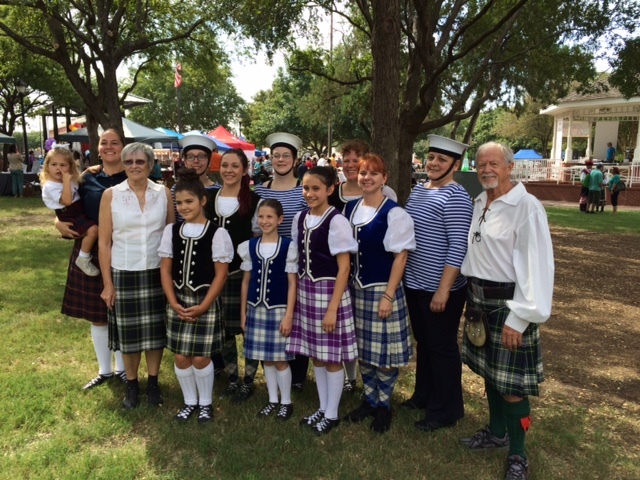 Society, demonstrated a variety of Scottish dances at the Plano Fest. 2019 Dates: TBD, generally the second full weekend in November. 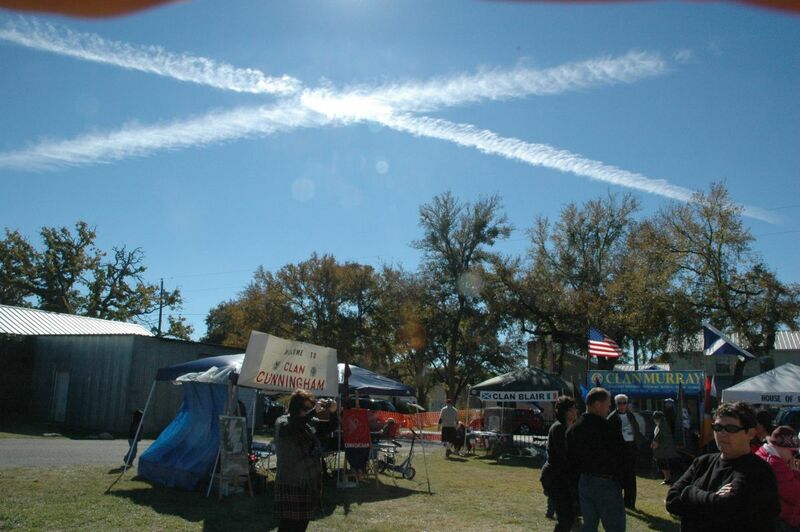 jet con-trails forming a St. Andrew's Cross on a blue field overhead. Note: Five of the last eight Burns dinners were Sell Outs! So don't wait until the last minute to get your 2020 tickets! 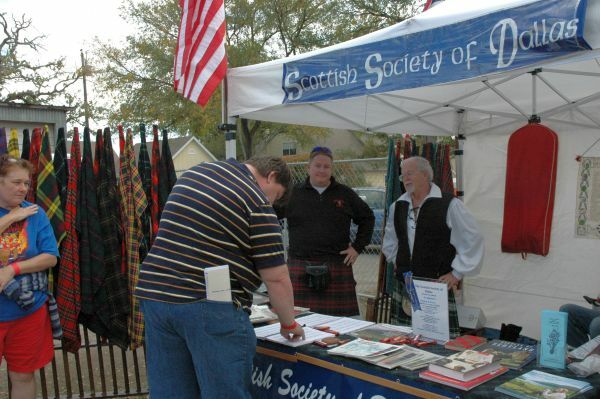 Scottish-related societies. Better yet, get involved by joining one of them! Thanks to all of you who stopped by our booth in 2109. It was a great festival for us! 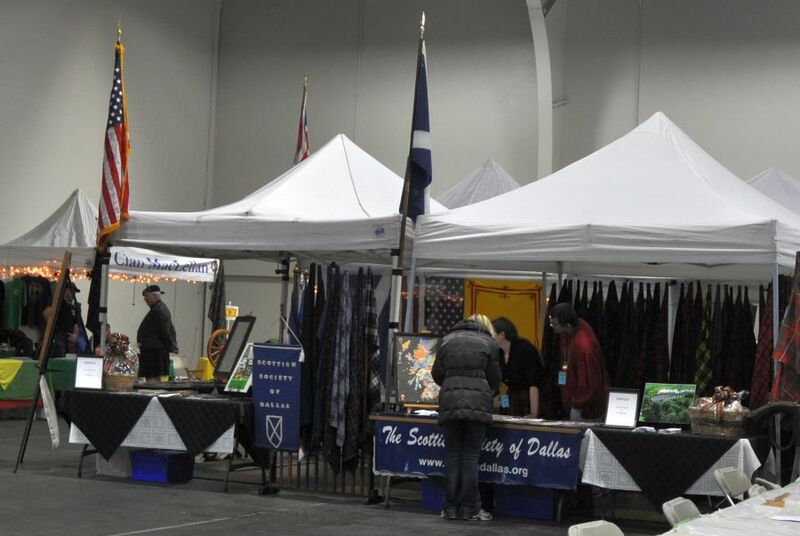 We met lots and lots of festival goers and had excellent "booth support" from our members... Thank you all and we look forward to seeing you again in 2020. Scotland! 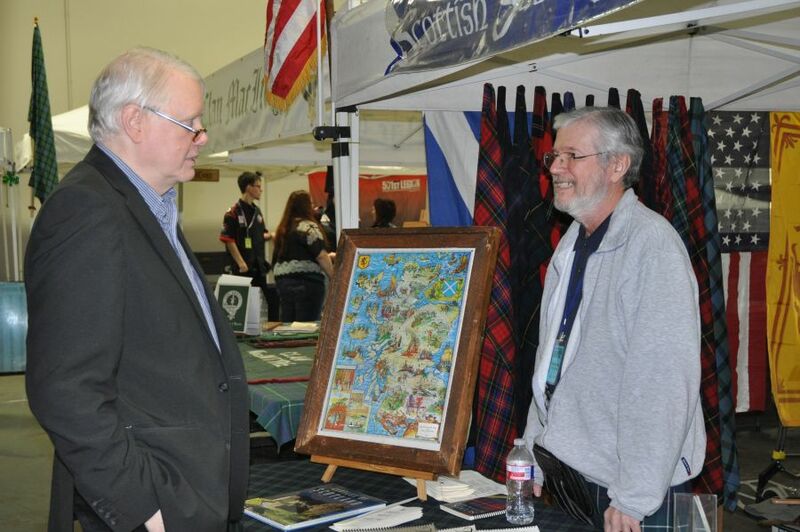 Below, former President Larry Duncan (right) speaks with another guest. 2020 Dates will be posted as soon as they are available. 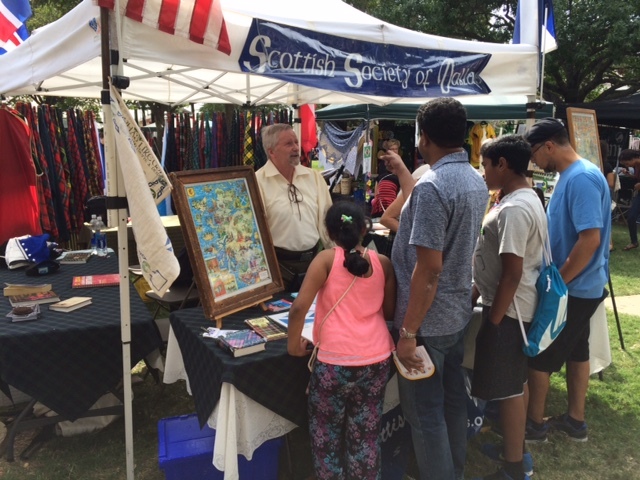 The Society would like to thank all the festival attendees who dropped by our tent to visit with us this year. It was a pleasure meeting each and everyone of you. 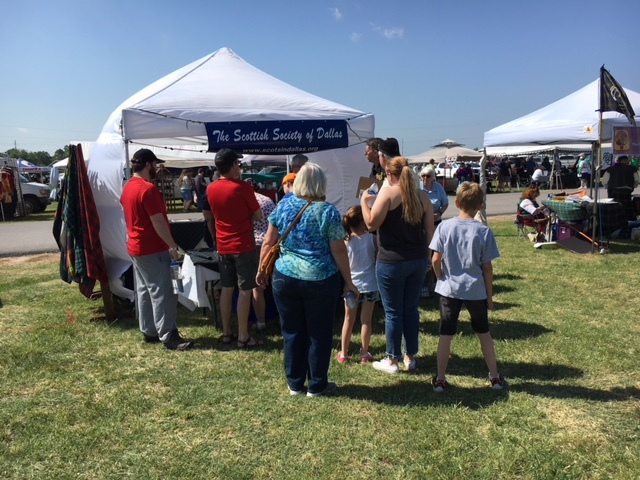 Moreover, a huge thank you is owed the Society members who came out to volunteer in the tent. 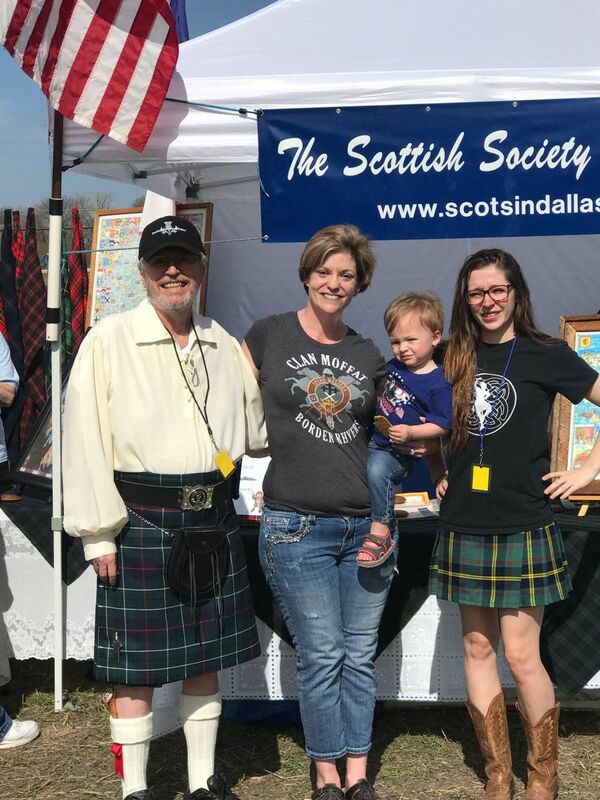 Guest Wendy Woods and her grandson stopped by our tent and posed for a picture with former Pres. 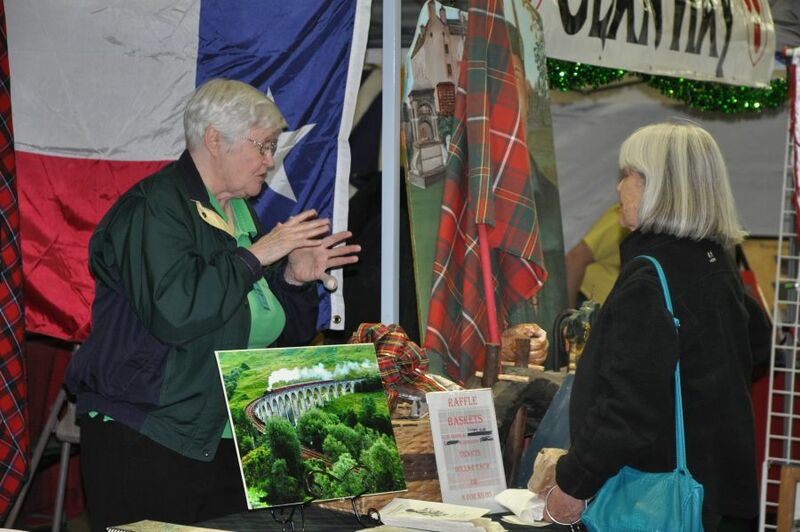 Larry Duncan and long time 'adjunct' member, Brooke Sym, at the Sherman Celtic Festival, March 24, 2018.
at the Sherman Celtic Festival, March 24, 2018.